Grated RF remote control allows longer distance and wider angle. Clean: Clean the dust of your device ensure the surface is free from dust before installation to avoid falling off. Cut(As needed): Cut on the cut marks(White Lines) on the strip to needed length. Stick: Remove the 3M adhesive backing on the strip and stick the strip in desired place. Connect: Plug the USB cable into the tv's USB port, computer's USB port, power bank, charging adapter or 4*AA battery box (A UNIQUE BATTERY BOX IS INCLUDED BUT BATTERIES ARE NOT INCLUDED). Control: Use the RF wireless remote controller to change the vibrant color strip kit until you are satisfied with the lightness, color, lighting speed and mode effect. 【Battery & USB Powered】 RGB Led strip lights use kit powered by 4 AA batteries, no need extra AC or DC power supply, can be used on cloth, camping tent, party, bicycle, automobile. Also can be powered with USB adapter, power bank, PC for longer time to use, perfect for computer, HDTV backlight, accent, patio, auto, ambient, neon lighting etc. The working voltage is 5V, safe for using. 【RF Wireless Remote Control】 Up to 32.8ft (10M) control distance, no need to aim at the receiver and no conflict to the TV remote. 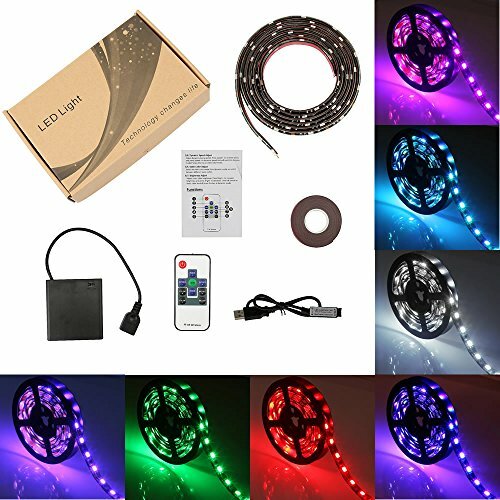 Wireless LED light strip with 20 changing colors,18 modes, 6 dimming levels, 6 speed levels, flashing mode, jump mode, fade in and out mode. Easy to operate, handheld, multibutton remote to turn lights on/off & select color. 【Quick and Easy Installation】 With adhesive 3M tape to attach to almost any surface flexibly as you like. We also offer you one extra 3M tape as a gift in case it falls off in some extreme situations. Flexible rope lights can be cut and adjust to any length. It can be roped easily that you can carrying it convenient. 【DIY Decoration】 Waterproof RGB Led lights strip kit is perfect for indoor & outdoor decoration. For kitchen, cabinet, dining room, bedroom, party, automobile and camping tent, computer, desk, corner, TV back light, cars, garden, patio, pool décor, also decorate on festivals. This flexible water-resistant strip light will highlight any installation, make your house looks special. 【After-Sale Service】 We promise you a full 12 month warranty, 30 days money back guarantee. Any questions about the product can be sent by e-mail Amazon contact us, we will response you within 24 hours. If you have any questions about this product by imenou, contact us by completing and submitting the form below. If you are looking for a specif part number, please include it with your message.